The Geelong Cup is a Group 3 staying event held at Geelong in October as a key early guide for the Melbourne Cup. The Geelong Cup is a Group 3 race held at Geelong Racecourse towards the end of October on a mid-week Wednesday spring meeting. Contested over the same mile and a half distance as the previous weekend’s Caulfield Cup (2400m), the Geelong Cup is an important race on the spring calendar and a top early Melbourne Cup form guide. One of the major lead up events to the iconic Group 1 Melbourne Cup (3200m) over the two miles at Flemington on the first Tuesday of November, the Geelong Cup is targeted by foreign raiders and local hopefuls looking to make the 24-horse field for the ‘race that stops a nation’. The Geelong Cup form has stacked-up a number of times in the Melbourne Cup results including a trio of internationals doing the double: Media Puzzle (2002), Americain (2010) and Dunaden (2011). The Geelong Cup is held under handicap conditions and is open to horses of all ages and sexes. With $300,000 at stake, this is a very lucrative Group 3 event. The Geelong Cup is the headline event on its race day. It shares the race program with two Listed races including the Geelong Classic (2200m) for three year olds. The biggest event on the local racing calendar, it is a public holiday in Geelong on Cup Day. One of the better lead-up races to the Geelong Cup is the Group 2 Herbert Power Stakes (2400m) held at Caulfield a week and a half prior. The Geelong Cup has long been considered a good guide to the Melbourne Cup, where many of the better contenders in the field end up. Indeed, due to the high correlation between successful runners in both cups, the Geelong Racing Club has adopted the slogan “Gateway to Glory”. The 2017 Geelong Cup ran on Wednesday October 25, 2017 . Check out the full Geelong Cup 2017 Results & Finishing Order below, following the link to read more on the narrow half-head win by the Michael Moroney-trained import Vengeur Masque who broke through with his first Australian run and who is now chasing a spot in the 24-horse 2017 Melbourne Cup field on the first Tuesday of November. The Darren Weir-trained Gallic Chieftain was the hot Geelong Cup favourite, but after a tough run got back to the inside and dived late having to settle for second. Violate rounded out the Geelong Cup Trifecta in third at a big price under a length beaten. FANATIC ($26) is way overs in Geelong Cup betting and is out to score another upset in a 2400m feature for Lindsay Park after Boom Time won the Caulfield Cup at 50/1 over the weekend. This mare is bred to stay, a daughter of Melbourne Cup winner Shocking, and finished off well in the Herbert Power Stakes (2400m) over this distance last time out, the same race that produced Boom Time (4th). 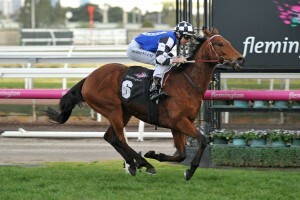 She ran sixth with good sectionals, is well-weighted for this and jockey Michael Walker has been back to winning form. Drawn to win and can surprise. GALLIC CHIEFTAIN ($2.90) is the red hot favourite and is also out of the Herbert Power having done a brilliant job for third. Loves Soft going, drawn ideally in gate two and Craig Williams in the saddle is another plus. LIZZIE L’AMOUR ($16) is also overs at her current price, the Group 1 winning Kiwi mare four runs in and out to atone after three unplaced Melbourne starts of firm tracks. Her Soft form is outstanding and she’ll be in the mix. Read our full 2017 Geelong Cup Betting Tips & Preview. The latest Geelong Cup betting markets on the internationally-rich field will be listed below, prices provided by Ladbrokes.com.au for you to lock in your Geelong Cup tips at the best price this spring. The Geelong Cup field attracts a star-studded list of both local and international stayers each Melbourne Spring Racing Carnival that are targeting the Group 1 Melbourne Cup (3200m). Runners in the Geelong Cup field may come off lead-up spring runs in races like Flemington’s Group 1 Turnbull Stakes (2000m), the Group 2 Herbert Power Stakes (2400m) or even the Group 1 Caulfield Cup (2400m) run just four days before Geelong Cup Day. The official Geelong Cup Field & Barriers are announced on the Monday of race week and will be provided in full belong once released by Racing Victoria. See below for the full 2017 Geelong Cup Final Field & Barrier Draw, following the link to read more on the line-up of Melbourne Cup hopefuls in the race including Darren Weir’s Herbert Power Stakes placegetter Gallic Chieftain and Cranbourne Cup runner-up Berisha drawn the outside barrier (12 of 12). The Geelong Cup nominations usually feature a broad selection of talented stayers from around the world. Largely made up of Victorian and foreign runners, the Geelong Cup nominations provide a fairly accurate indication of which horses are hoping for success in major staying events down the track. A large number of foreign horses enter the Geelong Cup nominations for their first start in Australia in preparation for the Melbourne Cup. The 2017 Geelong Cup nominations will be published below once released on the Thursday prior to the race. The Geelong Cup 2017 Nominations attracted a bumper 23 entries including three horses racing in Saturday’s Caulfield Cup field: Wicklow Brave, Sir Isaac Newton and Boom Time. The Willie Mullins-trained Irish veteran is the top international entry, while trainer Robert Hickmott and owner Lloyd Williams have a bumper seven Geelong Cup nominees this spring. The Geelong Cup has a fairly extensive history, reaching back to 1872 when Flying Scud took out the inaugural edition. Originally raced over 16 furlongs, the Geelong Cup distance was adjusted to 2400m in 1972 when the country switched to the Metric System of measurements. Initially a Principal race, the Geelong Cup was granted listed status in 1979. In 2002, it was upgraded to Group 3 and has retained that status since. George Hanlon is the equal most prolific Geelong Cup winner with James Wilson, with a total of four Cups. Hanlon has also trained three Melbourne Cup winners, and is justifiably included in the Australian Racing Hall of Fame. The Melbourne Cup is always held on the first Tuesday in November, and the Geelong Cup is always held exactly thirteen days prior. As a result, the Geelong Cup usually falls on either the third or fourth Wednesday in October. The Geelong Cup is famous for producing top winners. Some of the more notable recent Geelong Cup winners include On A Jeune (2005), Leica Ding (2009), Americain (2010), Dunaden (2011) and Ibicenco (2013). Geelong Cup results since 2000 are listed below.